Bay Area animal shelters are packed with animals that were scared by fireworks and ran away over the Fourth of July holiday weekend. Twenty-one animals were found wandering the streets of San Mateo County, and as of Thursday, 17 of them are still waiting to go home, according to the Peninsula Humane Society & Society for the Prevention of Cruelty to Animals. "We believe many of the animals that came into our shelter fled their homes after becoming frightened by fireworks and other festivities associated with the Fourth of July," PHS/SPCA spokeswoman Buffy Martin Tarbox said. It's more of the same in Sonoma County. Animal control officers brought in 16 strays from Sunday to Tuesday — and that number could rise. Of them, nine dogs ended up at the Rohnert Park Animal Shelter, which was nearly filled to capacity. Two dogs have since been reunited with their families. 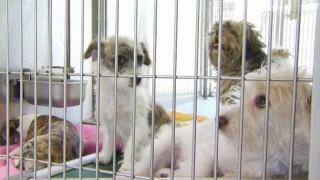 California law requires shelters to keep found animals for four days before making them available for general adoption. Any San Mateo county residents who are missing their pets are advised to look for them at the Coyote Point facility in San Mateo at 12 Airport Blvd., between 11 a.m. and 7 p.m. on weekdays or 11 a.m. and 6 p.m. on weekends.